If you are a regular at Portland A&O events, then you probably already know Jody Rose. For the past 2 years Jody has been the chair of the AOYP committee, helping to transform a simple idea — of creating a supportive and inclusive community for Portland’s Athletic & Outdoor young professionals — into a reality. But volunteering on the AOYP committee, kicking off AOYP networking events and giving back to Portland A&O is only a side hustle. 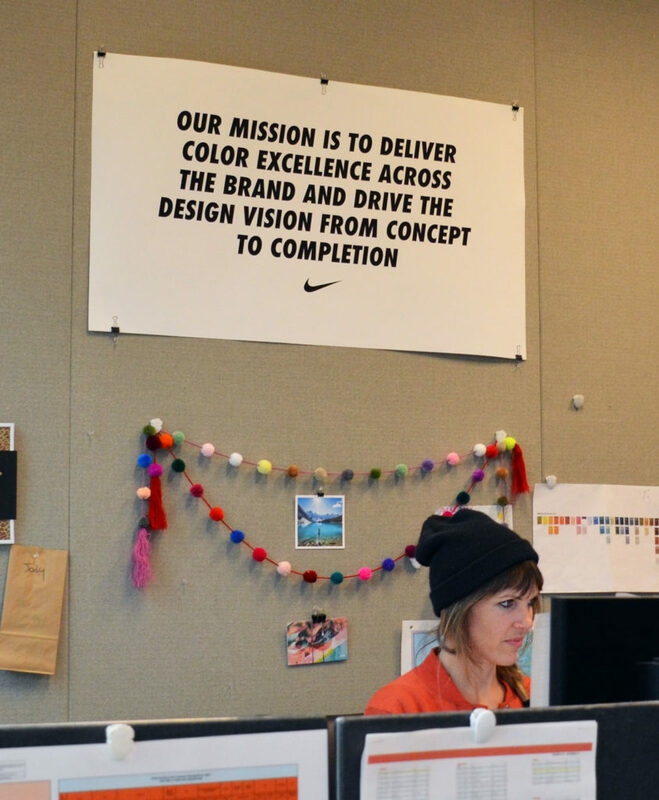 Her day job is Color Development Manager: Run /Train /Live at Nike. Since both Portland A&O and AOYP are recruiting for more committee members and task force leaders, we thought this was a perfect time to get to know Jody a little better. 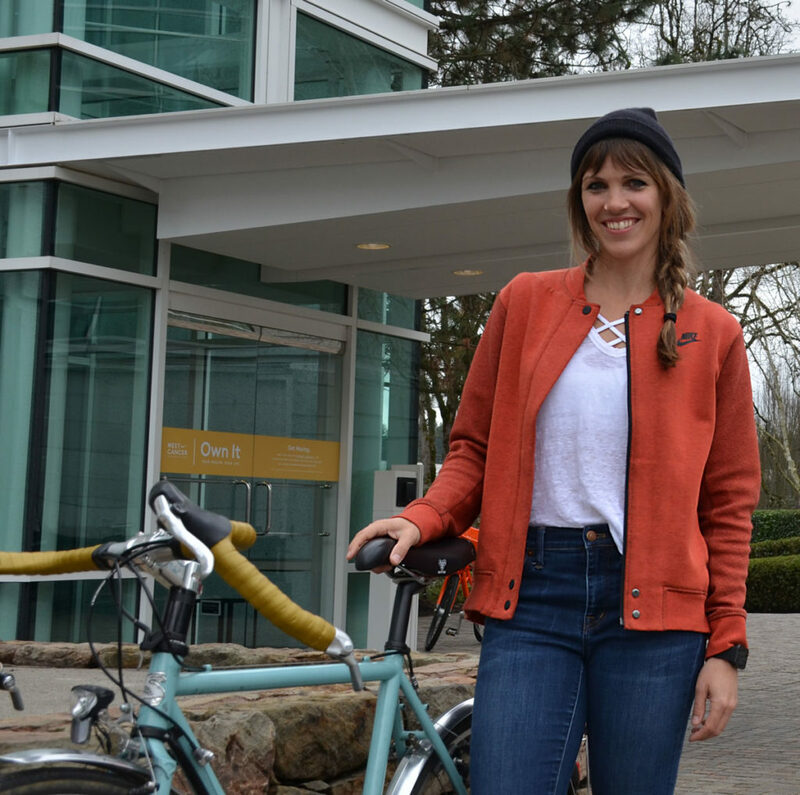 We recently visited her office at the Pete Sampras Building on Nike campus to learn more about her job and her AOYP volunteer experience…. A typical day involves everything from meetings (lots of meetings!) to reviewing color in a lightbox. I manage a team of 5 developers who work to deliver consistent color in all apparel materials in production and provide color exploration opportunities and tools for apparel and color design partners. 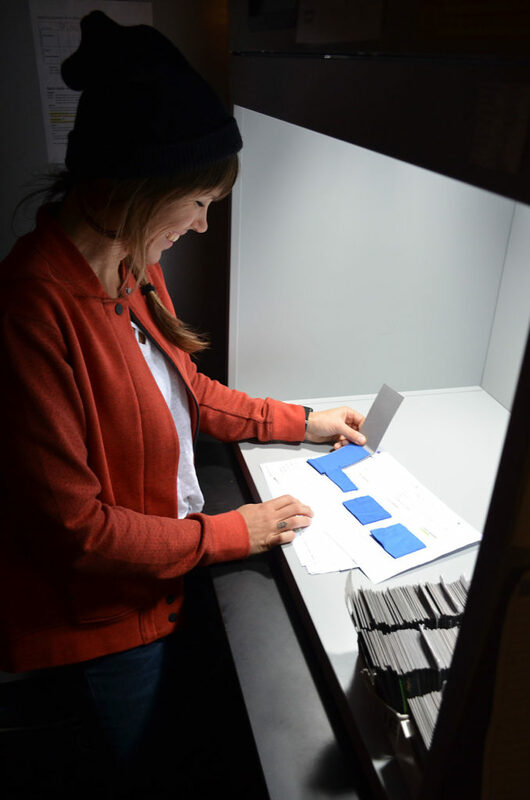 I love it—I love the big idea generation where we try to dig up solutions for tricky materials on quick timelines, down to spending time in the lightbox, evaluating what our suppliers are providing. The longer I am in my role, the more I love collaborating with and presenting to other functions. I was a junior high teacher in a previous career; having the opportunity to inspire excitement (in color development in this case) is energizing. Finally, I have appreciated my opportunities to travel to meet and work with our overseas suppliers (currently writing this from Singapore). The cultural differences are so fascinating, but meeting the people producing these products makes the world feel smaller and more precious. What do you like about the A&O Industry? The Portland A&O industry? I am such a big fan of work-life balance; there is so much satisfaction in continued professional and personal growth. The A&O industry reflects that—a lot of people in this industry work hard so they can play hard. Portland specifically has such a wonderland of a backyard; it is a no-brainer to be able to work in a place that resonates with those personal values of playing outside. How do you feel Portland shapes A&O? I can’t say enough about Portland’s access to what I lovingly refer to as “dirt church” – trails, trails, trails. Trails for running, hiking, mountain biking, scrambling, skiiing, fishing…we are spoiled here. Its on these trails where I have an increased appreciation for gear that works so I can do what I love, longer. The weather—I live for summers here, but will annually take a winter trip to somewhere warm and sunny. I think it is part of an overall Portland weather survival strategy. Even so, the conditions are mild enough to keep people moving year round, which keeps this industry pumping with its own seasonal survival strategy—products and services for every activity, in all kinds of weather. What do you enjoy about being on the AOYP committee? Wow, this committee brings me more joy than I had ever anticipated. This crew is smart, creative and has such a broad reach that I feel constantly inspired by each of them. I have grown to know and love the cycle of putting on events – idea generation, hammering out details, selling tickets, always worried that no one will show up, and then sheer overwhelm-ment by the numbers and faces and magic that happens. Its pretty cool—I am so honored to be part of that. And of course, we always find a way to eat nachos together somewhere. 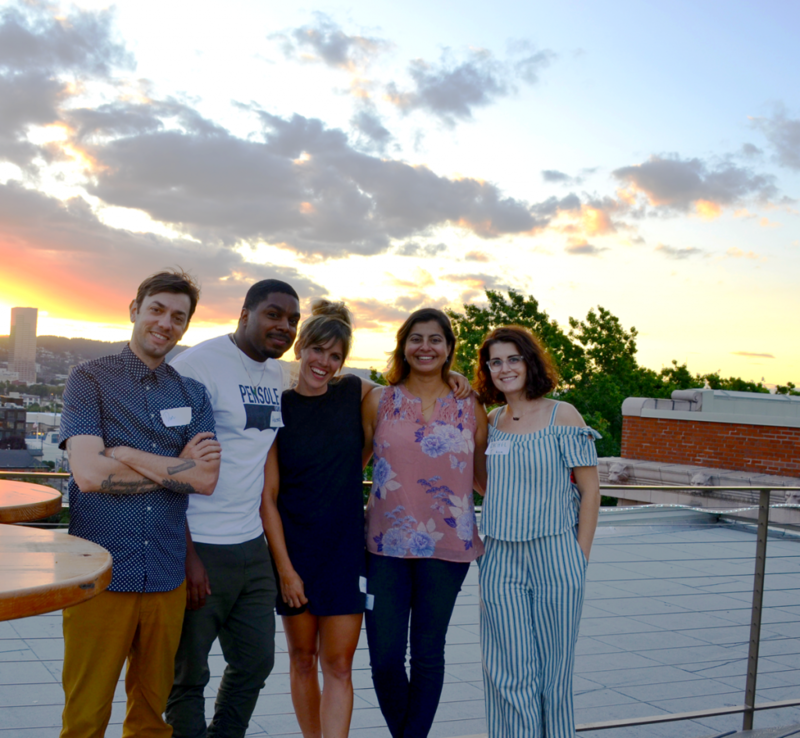 The committee, IMHO, has been successful due to its members having skills in connectedness to industry, event planning, event attending, influence and persuasion, creativity and commitment. AOYP gives back! What advice would you give someone hoping to get a job similar to yours? A job at Nike? Network! Know your strengths and figure out how to tell someone they can’t live without them. Ask your network who they recommend you meet with next. Be concise. Get in front of people. Do your research. Want to grow your network? Join the AOYP Committee? Make in impact on Portland A&O? Fill out our survey and get involved today!